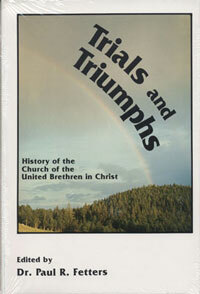 Trials and Triumphs tells the history of the United Brethren church from 1752 to 1981. The book was edited by Dr. Paul R. Fetters, then Dean of the Huntington College Graduate School of Christian Ministries. Five persons wrote sections of the book, taking a period of the church’s history. No other book provides such a comprehensive history of the United Brethren in Christ denomination. 31. An Overview of the Period: 1889-1929.